This crochet bag pattern features a lovely textured design that you will enjoy showing off wherever you go. The stitch pattern is similar to the crunch stitch, but with a slightly different twist. It is shown below in a variegated cotton yarn, but any solid color will look great as well. And with summer not too far away, you could also try a combination of bright and lively colors to bring this crochet bag to life. Although this bag pattern is labeled as an intermediate design, it is actually easy and a mindless pattern to follow once you get going on it. It is crocheted in the round and in one piece from the bottom up, which means less ends to weave in at the end. 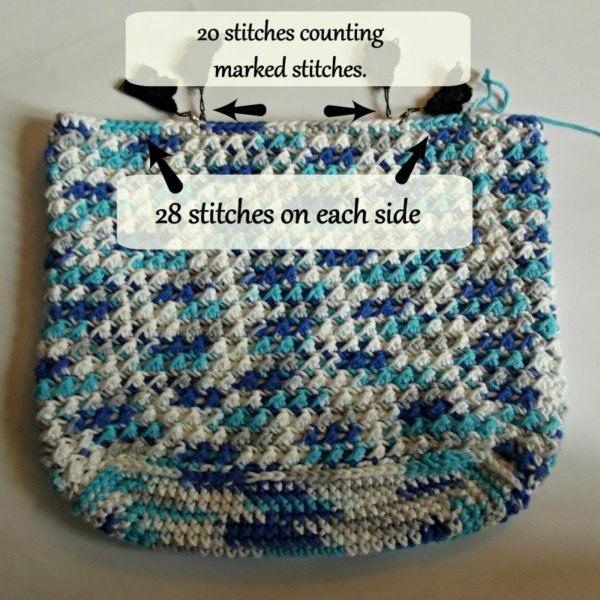 The handles on this crocheted bag are marked off before you begin crocheting. That way you know they are centered and will look great once the bag is finished. Below is an image showing how to mark them off with stitch markers. It is important that you complete this step because the seam ends up in a slight spiral. I used a cotton in the sample, but any similar weight yarn will work. And when you’re done, you’ll want to line it for a durable crochet bag. When you follow the example of marking off the handles, you can easily increase or decrease the size of this bag. Simply make your base to the size that you want and then follow the rest of the pattern making necessary adjustments for the handles. Thus, it’s easy to use this crochet bag pattern to make a cute purse or a large beach bag for the summer. Gauge: 7 sc sts = 2″. Finished Size: 12″ wide by 12″ high when laying flat. Bottom is 3.5″ wide. Rnd 9: Ch 1, (sc, ch 1) in same st as join, *sk next st, (sc, ch 1) in next st; rep from * around to last st; sk last st; join with sl st in first sc. Turn. Rnd 10 (WS): *Sl st in ch-1 sp, hdc in next sc; rep from * around; join with sl st in first sl st. Turn. Rnd 11 (RS): Ch 1, (sc, ch 1) in first hdc, *sk sl st, (sc, ch 1) in next hdc; rep from * around to last sl st; sk last sl st; join with sl st in first sc. Turn. Rnds 12-47: Rep Rnds 10 and 11 omitting last turn at Rnd 47. Lay the bag flat and mark off the handles. Note: Work into the back bumps of the chs to keep things looking the same on both sides of the handle. Rnds 51-54: Ch 1, sc in same st as join and into each st around; join with sl st in first sc. Fasten Off at last rnd. 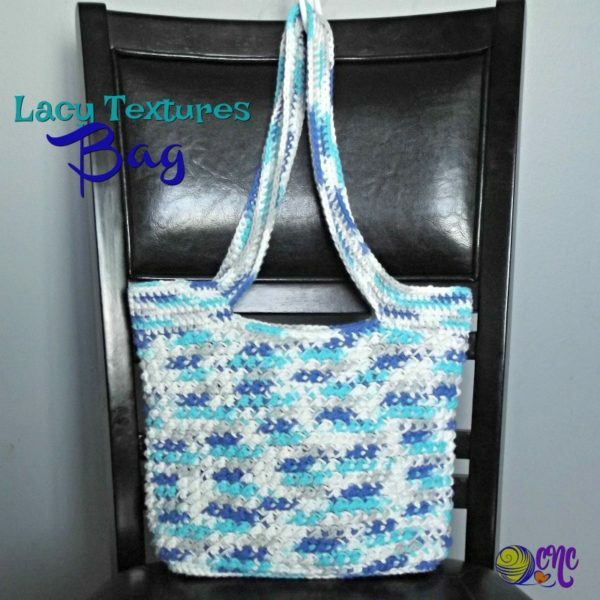 If you enjoyed this crochet bag pattern, then you might also enjoy the rest of the collection in the Lacy Textures Series. Or, check out more crochet bags here on CNC. Thank you so much for sharing the pattern! With a few tiny mods this will make the perfect messenger bag for my youngest son. He’s been combing through patterns and when he found this he asked if I could make it slightly wider without increasing the depth or height. He also requested a flap with a frog or buckle and a Shoulder strap. Like I said easy mods for such a simple pattern. With a denim or fleece lining and some darker yarn colors he will be in heaven!